I’m in Placencia, a sleepy little town at the end of a 20 mile long peninsula in Belize’s Caribbean waters. I awake early in the morning and begin preparing for the day’s adventure. My tiny cabana on the beach has no A/C and I’m already dripping with sweat from the hot, humid air. Knowing that today’s journey to swim with whale sharks came with not-so-great odds of success, I tried not to get too excited about what was to come. Little did I know just how exhilarating the day was destined to be. 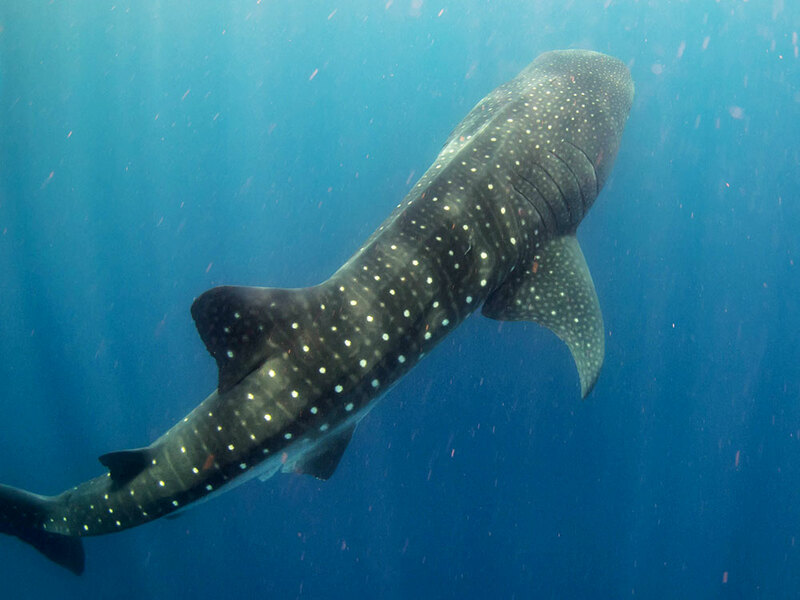 Whale sharks are the biggest fish on the planet, however they pose little danger to people as they are slow and docile. 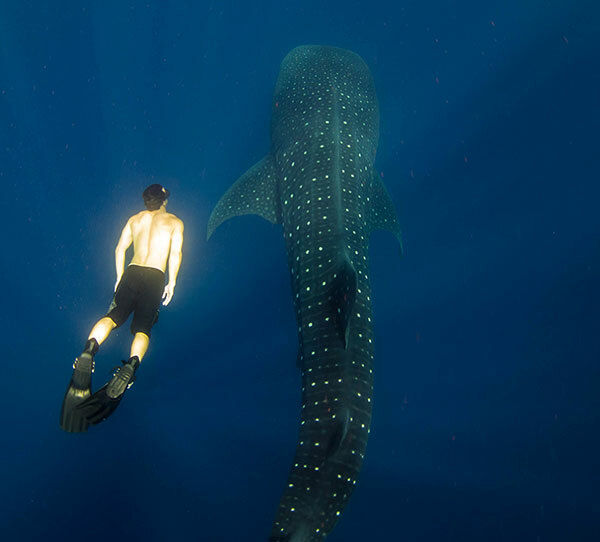 Swimming with them is an experience sought after by people all over the world and today was going to be my chance. There are few places in the world you can get in the water with whale sharks; and Placencia is one of them. For a few months each year during the cycle of the full moon, they come to feed in Gladden Spit, an area 20+ miles off the coast. I headed out with Splash Dive Center, Placencia’s biggest dive operator with the plan to go on two dives in search of spotting them. The boat ride takes around 1-1.5 hours to reach Gladden Spit, the designated zone for spotting them. The captain and crew began searching for signs of them. After picking a spot, we all dove below the surface with great anticipation of what would come. The water is eerily deep since the bottom is not visible to the eye, no reference points exist and there is nothing surrounding you except endless blue water. We go to a depth of 40 feet, followed by 80 feet and see nothing. After swimming for what seemed like hours, we had reached our maximum dive time and surfaced. Having seen nothing but blue water, it was probably the least pleasant diving experience I’ve had to date. 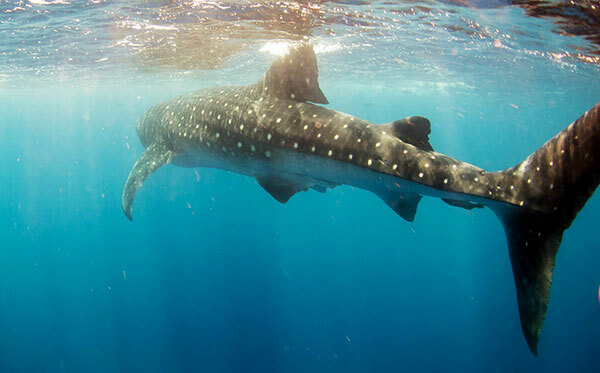 Spotting a whale shark in these conditions felt hopeless, and most of the boat’s moral was quickly fading. We left the whale shark spotting zone for our surface interval (a break between dives) to eat lunch and regroup. Along the way, a large pod of dolphins swam with the boat and did tricks – our first sign that things may turn around for the day. During our meal the captain spotted large numbers of birds gathering in the water; this was an indicator that whale sharks could be nearby. The engines roared and the chase was on. Everyone’s glum mood was disappearing and began to re-energize with hope. Before we even knew what hit us we could see a dark silhouette below the water.. it was an enormous whale shark! Next came a mad scramble for everyone to jump into the water and meet what they had been waiting anxiously for. What came next was one of the most humbling experiences of my life. 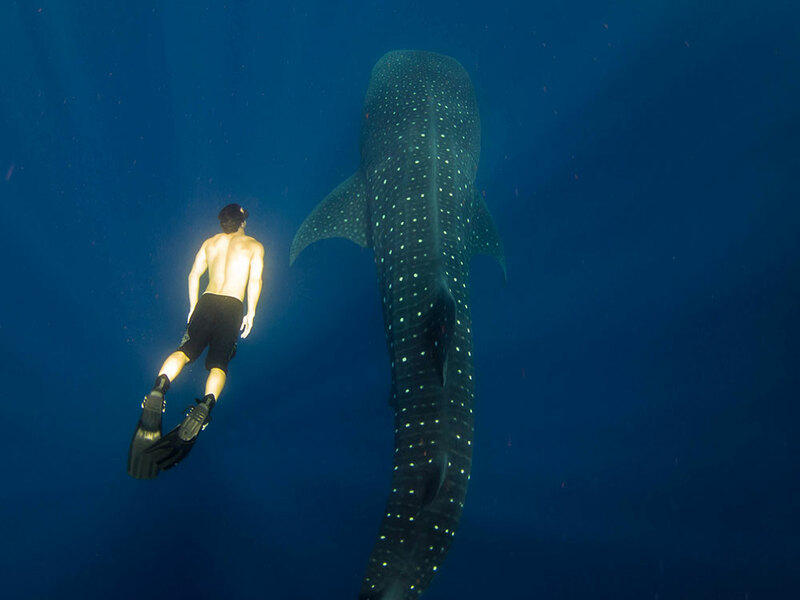 There I was, in the water with a 40 foot long whale shark just feet away from me. I could literally reach out and touch it! This was the kind of moment that takes your breath away, especially when you’re trying to kick your feet quick enough to keep up with a whale! No less than 2 minutes later and it had swam away, too quick to keep up with. We all swam back to the boat, our bodies shaking with excitement, and minds still processing what we’d just experienced. Those 2 short minutes had made the entire journey worthwhile, but it wasn’t over just yet. 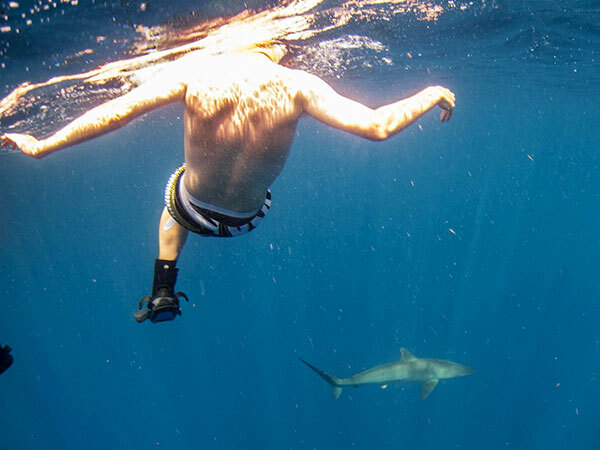 Having agreed to forgo a second dive, we instead pursued what appeared to be the better odds – spotting whales at the surface to snorkel with them. 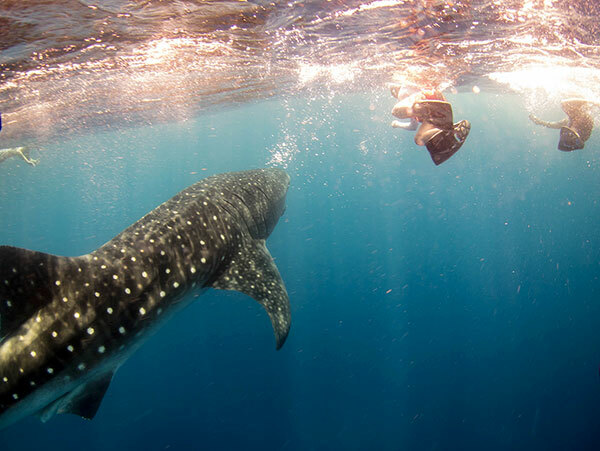 In total, we plunged in the water and swam with whale sharks on five separate occasions. Those of you who fear other kinds of sharks might not want to read what’s next. It’s also fairly common to see the ‘other’ kind of sharks during these expeditions and from the first jump in we had two other very curious reef sharks with us; roughly 8-10 feet each. During our third time in the water they came very close to check us out. Swimming beside these majestic creatures was an unforgettable rush like none other! 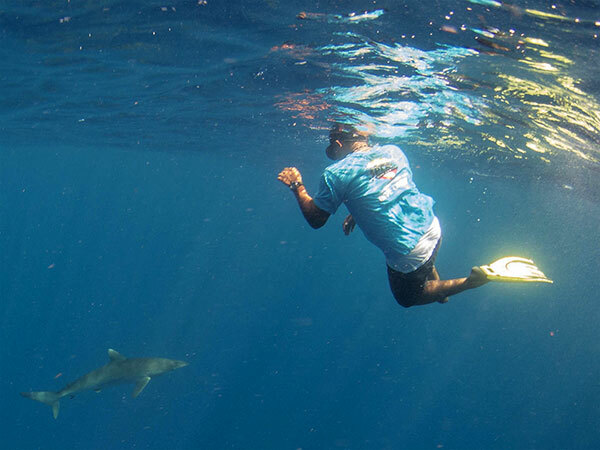 I’m so jealous – that looks amazing (although I’d probably had a heart attack if a reef shark came anywhere near me!) What a fantastic experience. I do hope that there is no detrimental affect on the sharks or the oceans as this kind of tourism is getting more and more popular. There are some rules and regulations in place to prevent harassment. You’re not supposed to touch them, and they only allow a few boats in the Gladden Spit zone at a time to prevent being too crowded. That is good to hear. I know some places, like the Red Sea, are really at risk from the tourist industry. Superb! One of my biggest dreams is to dive with wales in Madagascar! Great experience! That’s incredible! I would love to see them some day. Maybe later this year or early next year as I’ll be traveling around Central America and am planning on stopping in Belize for a bit! I know there’s several places in C. America you can attempt it.. Utila in Honduras, Belize, and near Cancun, Mexico. You just have to make sure to go during the right time of the year. Hey James. You really captured the day. You guys got some great footage! Wow! It takes my breath away just thinking about it. How exciting! I guess I need to get myself back over to Belize. What an incredible experience and how lucky you were. I am kayaking tomorrow in whale country – the St. Lawrence River and hope to see Beluga whales. I’ll also be in blue whale country but no interest in seeing one of those from my kayak!! Wow that looks like such a fun experience!! OMG, this looks terrifying and exhilarating at the same time. I would have had a heart attack with that shark turning up all of the sudden though. Wow, what a cool experience! We got to swim with reef sharks one time, but to be able to swim with the largest shark in the world, all I can say is WOW! Oh man, awesome pictures! How magical to swim beside them. I’ve dived in a bunch of places but haven’t seen whale sharks yet! Damn! I am so excited for my trip to Belize in 56 days!! What camera do you use for all of your dives? I love the quality!!! Belize is a blast, have fun! I use a Canon point and shoot with an underwater case and wide angle lens.